Meet your guide at your hotel in South Tenerife and set out to explore the lava-sculpted landscapes of the UNESCO-listed Teide National Park. Keep your camera close to hand as you wind through the pine forests and rural villages, and stop to capture photos of the startling UNESCO-listed landscapes. Drive through the rugged lava landscapes of Las Cañadas del Teide, pose for photos by the unique Roques de Garcia rock formations and admire views of the Pico Viejo and Mt Teide volcanoes. Continue through the desolate moon-like landscapes of Llano de Ucanca, as your guide explains how the geological wonders have been formed over millions of years of volcanic activity. 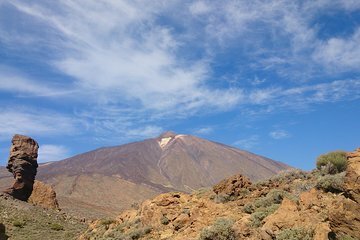 Climb the slopes of mighty Mt Teide as your guide points out filming locations for films like ‘Planet of the Apes’, ‘Clash of the Titans’ and ‘Wrath of the Titans’. Finally, ride the cable car (extra cost) up to the peak of Mt Teide and soar to the summit of Spain’s highest mountain. After a thrilling half-day adventure, end your tour with a return transfer to your hotel. This was marketed as a half day trip but when hotel pick up and drops offs were included it was a very long morning leaving at 8am and returning just after 3pm. The national park is well worth seeing but with long queues for the cable car there wasn't much time to look around but the long drive back was tedious.